I’ve been wanting to make labneh (yoghurt cheese), the traditional Middle Eastern dish for quite some time now. I’ve been making my own yoghurt for the last two years since beginning the Specific Carbohydrate Diet (SCD). 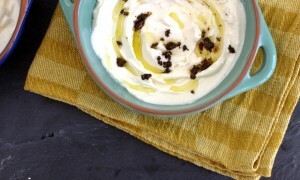 Making your own yoghurt at home can seem daunting at first but you’ll be surprised how quickly you get the hang of it. It also tastes so much better than store-bought alternatives. Yoghurt and fruit are part of my breakfast nearly every day. When I first read about labneh, I was really intrigued. 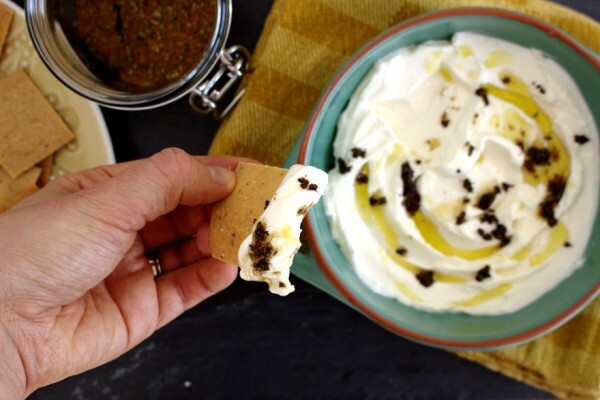 I loved the idea of making my own creamy – almost cream-cheese like dish to have with crackers, olives, ham etc. Around the same time I began reading about how to make labneh, I became addicted to Masterchef Australia. Who was the most recent guest judge, only Yotam Ottolenghi! For a whole week, the contestants cooked Middle Eastern cuisine under the guidance of Yotam, including labneh! It was a definite sign! I knew I just had to begin experimenting to make some. Experimenting is the correct word to use as my first attempt was disastrous. At least, I pretty quickly figured out why. I usually make my SCD yoghurt with goat’s milk as it is gentler on the gut. The goat’s milk yoghurt is delicious but it is quite runny compared to regular yoghurt. I had just learned to accept the runnier yoghurt as normal as I didn’t know any different. When I tried to make labneh for the first time with the goat’s milk yoghurt, it ran straight through the muslin bag. Disaster! Never mind, onwards and upwards. Next, I decided to use organic cow’s milk to make my SCD yoghurt and see if that would yield better results. After the 24 hours fermenting plus 8 hours refridgeration was up, I could not believe how creamy the yoghurt was. Luckily, I tolerated it really well so I think I will be making it with cow’s milk from now on. The labneh I made with the cow’s milk turned out AMAZING! Making labneh might seem intimidating because of the length of time it takes but think of it as passive time. You’re not standing laboriously over a dish stirring or even watching it. Once your yoghurt is ready, take a bowl, place a sieve over the bowl and then a cheesecloth (I used my almond milk bag). 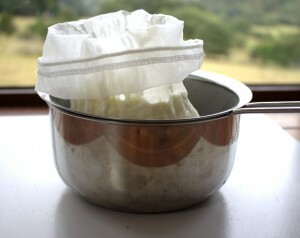 Pour the yoghurt into the cheesecloth, add a good pinch of sea salt (1 teaspoon) and tie a knot in it with some twine. That’s pretty much it. Leave it to drip in the fridge for a minimum of 24 hours. I left mine for roughly 30 hours. The process that takes place will create labneh. Essentially, the curds and whey separate. Like Miss Muffet! I never understood that nursery rhyme before! After 30 hours my labneh was a delicious consistency similar to cream cheese and the perfect accompaniment to my thyme and sea salt crackers. The longer you let your yoghurt drip, the firmer it will become. 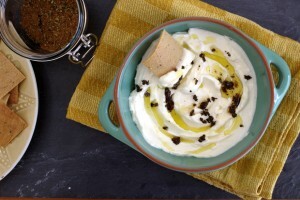 The traditional pairing for labneh in the Middle East is za’atar which is essentially a delicious blend of spices and seeds. I intended to make the za’atar to make this dish as close as possible to the original but I had a few problems. Firstly, I could not find sumac anywhere which is an essential ingredient in za’atar. I tried supermarkets, health stores and even the local farmer’s market. The next problem was that sesame seeds are also an essential ingredient in za’atar. Seeds are an advanced food and can be problematic for anyone with inflammatory bowel disease. So, I decided to improvise and make my own blend of SCD herbs and spices which I must say was delicious. It is not strictly traditional though, I must say that. If you don’t want to make any spice or herb blend at all, the labneh tastes delicious on it’s own with a sprinkle of sea salt and a dash of olive oil. Smothered on your favourite cracker, this is heaven. 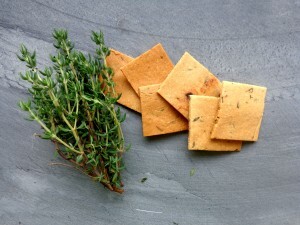 If you want to try to make my really easy and tasty grain-free crackers, you can find the recipe here. You can store labneh in the fridge in an airtight container for one week but I guarantee you it won’t last that long! For this recipe, you will need 4 cups of my SCD yoghurt which you can find the recipe for by clicking here. As above, the recipe works better with cow’s milk yoghurt rather than goat’s milk yoghurt. 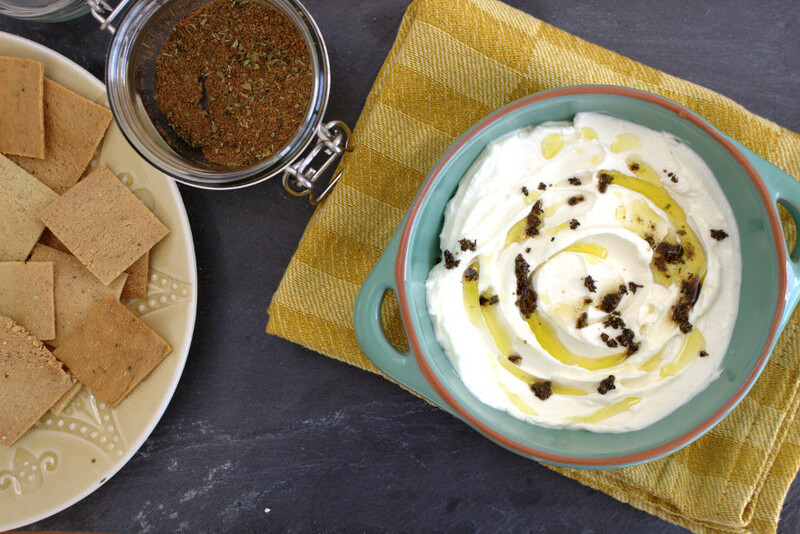 A delicious Middle Eastern cheese spread. This goes great with my thyme and sea salt grain-free crackers. Lactose-free and suitable for the Specific Carbohydrate Diet. Place a cheesecloth, muslin cloth or a bag for making almond milk into a sieve and then over a bowl. Pour the yoghurt into the cloth and add the sea salt. Tie a knot in the bag with twine and place in the fridge for roughly 30 hours. The curds and whey will separate and you will be left with a delicious cream cheese. Mix the herbs and spices in a jar. Heat the olive oil on a low heat and add one tablespoon of the herb/spice mix. Toast for a few minutes until fragrant but not burnt. You can keep the rest of the herb/spice mix in an airtight jar. Spoon the labneh into serving dishes, adding a generous amount of olive oil and sprinkle the toasted herb/spice mix on top. Dip your favourite crackers in and enjoy! The labneh will keep in an airtight container for a week.